Ridgefield’s James St. Pierre, left, and Joseph Misurelli celebrate after winning the FCIAC championship game against Danbury on Thursday. That knockout would not come as No. 5 Ridgefield rallied, closing the game on a 15-2 run, shocking the No. 3 Hatters 52-49 to win the FCIAC championship. It was a matchup of the previous two FCIAC champions with Danbury winning last season and the Tigers taking the title home in 2017. 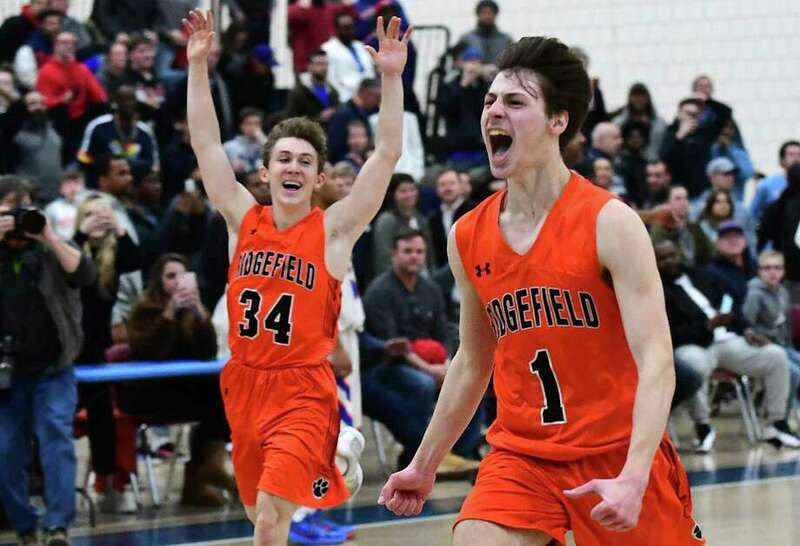 James St. Pierre’s drive and layup with 1:16 left gave Ridgefield its first lead since it was 2-0 and three clutch free throws by Luke McGarrity in the final minute clinched the Tigers second title in three years. The way the game unfolded, this one was just a little more special for the Tigers. St. Pierre, struggled at times over the first three quarters but came alive down the stretch, scoring 13 of his game-high 24 points over the final eight minutes of the game. Ridgefield was down by as much as 14 in the third quarter and were down 43-32 after three. The Tigers went to a full-court, trapping defense, speeding up the Hatters and causing turnover after turnover during the improbable rally. Danbury was paced by 15 points from Hernandez and 12 from Keon Moore. McGarrity scored 13 for the Tigers, including a big 3-pointer and four free throws in the fourth quarter. Ridgefield held Danbury to just six points in the fourth quarter while the Tigers scored 19. The Hatters cut the Tigers lead to 50-49 with :18.3 left on a jumper from the right side by Hernandez but two McGarrity free throws pushed the lead back to three. Danbury shot a 3 with under :03 to play but the ball hit off the rim and ended up out of bounds. James St. Pierre, Ridgefield. There was little doubt who would be named MVP, with St. Pierre taking home the honors after his incredible fourth quarter and stellar tournament.